Leonard Nimoy of "Star Trek" fame speaks after NASA's prototype space shuttle Enterprise landed at New York City’s John F. Kennedy Airport on April 27, 2012. 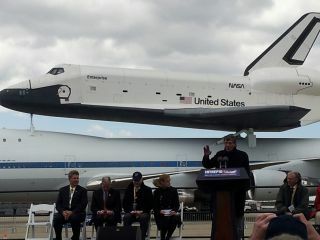 The final flight of the prototype space shuttle Enterprise apparently made a big impression on late actor Leonard Nimoy. A newly released video shows Nimoy — best known to legions of dedicated "Star Trek" fans as Mr. Spock — calling the ferry flight that brought the shuttle Enterprise to New York City for museum display the "most thrilling, amazing sight." The shuttle Enterprise was named after the starship Enterprise, which Spock, Capt. James T. Kirk and other crewmates used in "Star Trek." The newly released video, which is part of an upcoming film on Nimoy's life, was provided exclusively to Space.com. Nimoy's family is creating the new documentary called "COPD: Highly Illogical" to talk about Nimoy's life and the disease that claimed his life. The Enterprise-related footage shows Nimoy reminiscing about his 2012 visit to New York. He went there with his wife to see friends and family, and also to visit some contemporary-art galleries, a hobby of Nimoy's. While he was in the city, Nimoy heard a news report saying the space shuttle would be landing there that week. "I contacted the Inteprid people and asked them if we could get on the Intrepid to watch the flyby," Nimoy said in the video. "They came right back and said, 'Why don't you come up to JFK where it will be landing, and, if you'd like to, you could say a few words.' So I said, 'OK.'" Along with a small crowd of spectators, Nimoy watched the shuttle and its modified 747 carrier aircraft zoom by at 500 feet (150 meters) from the ground, leave for a planned loop around Manhattan and return for a final touchdown. "It was cold and windy. It was freezing!" Nimoy said with a laugh. "But it was exciting, really exciting to be there, and I was thrilled we were able to work it out." Most castmembers of the original "Star Trek" TV series, including Nimoy, were on hand for the shuttle Enterprise's unveiling in 1976. The vehicle was used for test flights in 1977; it did a world tour after testing was completed, and was eventually restored and displayed at the Steven F. Udvar-Hazy Center, part of the Smithsonian Institution's National Air and Space Museum. But NASA awarded the space-flown shuttle Discovery to the Smithsonian after the program's retirement, leading to the Enterprise's move to New York in 2012. Nimoy died of chronic obstructive pulmonary disease (COPD), an inflammatory lung disease most commonly present among smokers. Nimoy quit smoking decades before he developed the disease. After Nimoy made his medical diagnosis public, he tweeted occasionally about the dangers of smoking. Fundraising is ongoing for the film. After a campaign at FirstGiving.com that concluded last year, Nimoy's family is now raising money through Indiegogo. More information is available about the film at bit.ly/HighlyIllogicalFilm or COPDLLAP.COM.